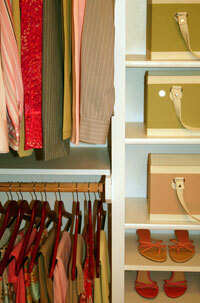 Many of the closet organizers sold in big-box stores are advertised as customizable. But if you’ve ever purchased and installed one of these systems, then you know that some manufacturers are using the word “custom” very loosely. Sure, maybe you can extend a hanger rod to fit the width of your closet, but do you have the freedom to add more shelving or incorporate drawers? Probably not. For closet organizers that are truly customizable, Cookeville, TN, homeowners can turn to the professionals at 31-W Insulation. We will thoroughly evaluate your practical needs to ensure that each and every item in your wardrobe has its own special place in your closet. Whether you have a reach-in or walk-in closet, we’ll maximize every square inch of it so you’ll have ample room for multiple seasons’ worth of clothes, shoes, and accessories. We’ll also assess your aesthetic preferences to make sure your new closet shelving perfectly suits your taste in décor. You’ll have your choice of wire or laminate/wood components in a multitude of colors, one of which is sure to pique your fancy. No matter the design you ultimately choose, you can rest assured that your closet organizer will retain its like-new appearance, long into the future. That’s because we exclusively offer closet organizers that have been engineered to stand the test of time by ClosetMaid – one of the industry’s most trusted manufacturers. If you’d like more information about the closet organizers we install in Cookeville, TN, and surrounding areas, contact us today and schedule a complimentary consultation.